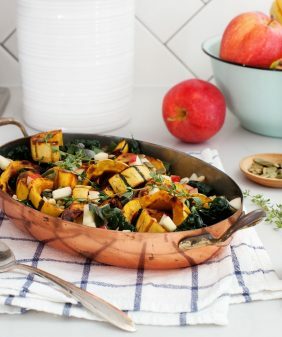 Delicata is my favorite winter squash, and this tangy/funky vegetarian side shows why. The squash is sweet, meaty, and, best of all, requires no peeling! 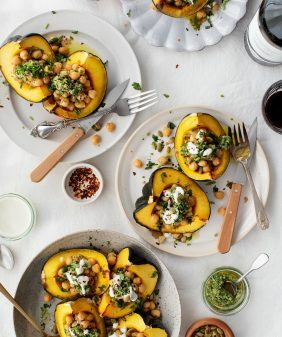 I’m popping in today to share one more fall squash recipe that would make for a tasty Thanksgiving side dish (or a tasty any-dinner side dish if you don’t celebrate T-giving!). This one is a little bit different for me because I haven’t been a big fan of blue cheese. That is, until a few weeks ago, when Jack and I shared a squash dish with blue cheese at the Publican (here in Chicago) that I was completely enamored with. 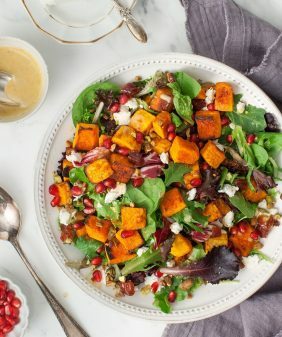 The pairing of sweet roasted squash with tangy cabbage, pops of sweet currants, and a base of a creamy, lightly funky, blue cheese sauce was so delicious that I was inspired to make my own version at home. And here it is! 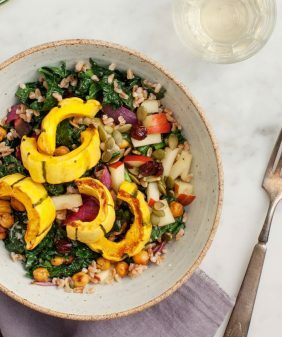 If you haven’t tried delicata squash – now is your moment. I love it because its small size makes it easy to cut. The skin, once roasted, is tender and delicious, so there’s no need to peel it. Roast the squash until it’s golden. While it roasts, make the creamy blue cheese sauce and marinate the cabbage with the currants in a bit of apple cider vinegar. Once the squash is done, it’s time to assemble! I just love the way the red cabbage pops against the squash – in color and in flavor. Both the sauce and the cabbage can be made in advance so this is pretty quick and easy to make. 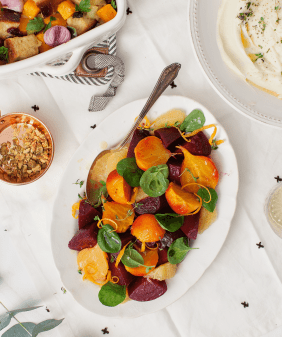 If you’re looking for more fall or winter vegetarian side dishes, head over to our recipe index for inspiration! This roasted delicata squash makes an excellent vegetarian Thanksgiving side. Roast the squash and marinate the cabbage ahead of time to easily assemble this dish before the big meal. Preheat the oven to 425°F and line a baking sheet with parchment paper. 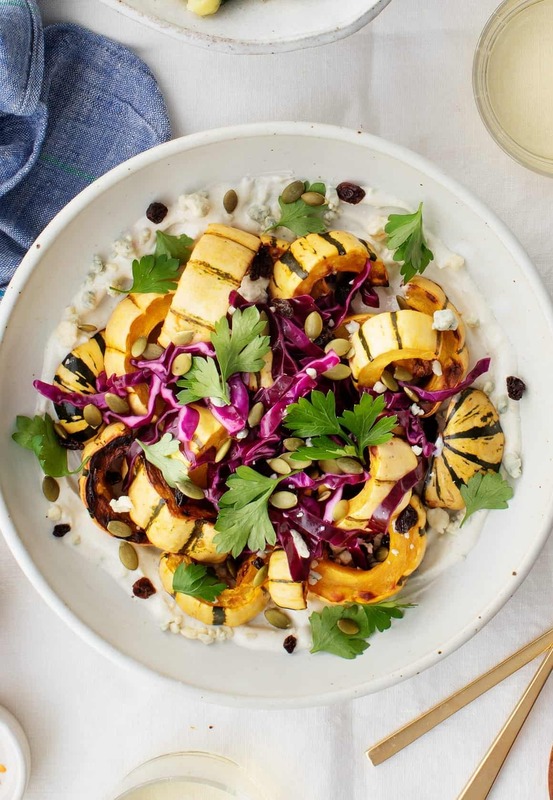 Slice the delicata squash in half lengthwise, scoop out the seeds, and cut into ½-inch half moons. 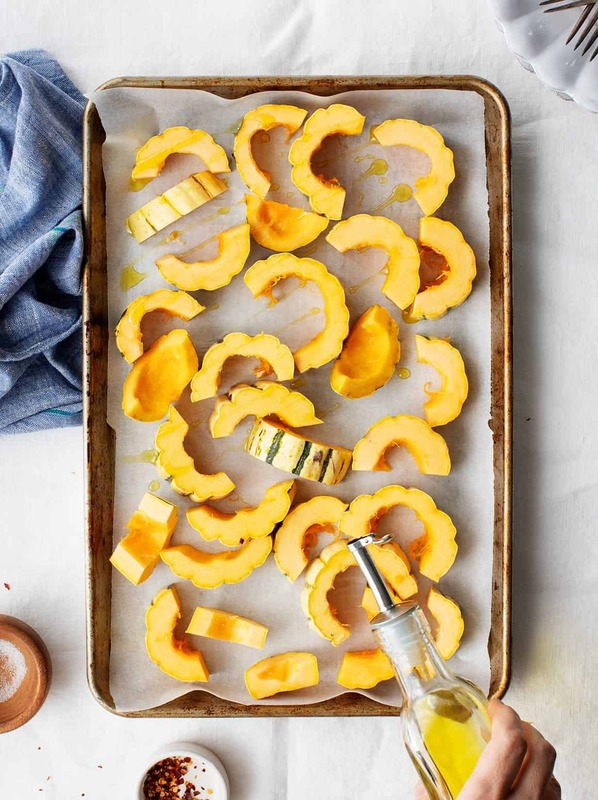 Toss the squash with drizzles of olive oil and sprinkles of salt and pepper. Spread evenly onto the baking sheet and roast for 25 to 30 minutes or until golden brown around the edges. In a medium bowl, combine the cabbage with ½ teaspoon of olive oil, the apple cider vinegar, maple syrup, currants, ¼ teaspoon of salt, and a few grinds of pepper. Set aside. In a medium bowl, stir together the yogurt, 1 tablespoon of blue cheese, the lemon juice, garlic, 1 teaspoon of olive oil, the cumin, ⅛ teaspoon salt, and a few grinds of pepper. Set aside. Assemble the salad on a large platter by slathering the yogurt onto the platter (depending on the size of your platter, you may not use all of it). 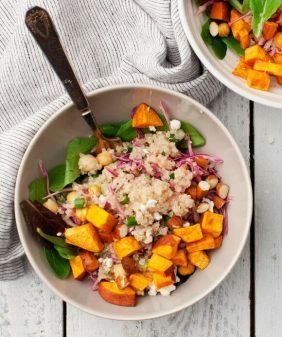 Top with the roasted squash, red cabbage, 2 tablespoons of blue cheese, and the toasted pepitas. Season to taste with more lemon juice, salt, and pepper. Garnish with parsley leaves. This looks delicious! Love your blog and thank you for sharing this recipe!! I really appreciate, Awesome Article, It is very useful and informative post, I think you are a good writer please keep going with your speed. Cool and Best article ever i have found.